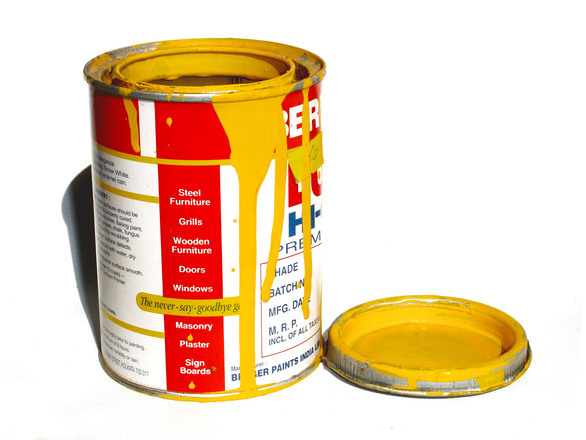 Can of safety yellow oil base enamel paint. A very tough finish to use around your home is alkyd paint. Commonly referred to as oil base paint, this finish can withstand a substantial amount of abuse. Common interior uses are doors, casing, base and cabinets. Doors, trim and cabinets are under constant assault from day after day. With children and vacuum cleaners being at the top of the list. Alkyd paint dries to a hard enamel like finish allowing considerable resistance to abrasion and abuse. This makes it a great choice for high traffic areas or rooms that require frequent washing with harsh chemicals. Bathrooms, laundry rooms and kitchens can benefit from the added protection. Oil base paint, in general, is very resistant to water and mild cleaning agents. Older homes often have numerous layers of oil base paint. If you do not plan to fully remove these layers, then oil based house paint is your best choice when repainting. Modern acrylic paint is able to stretch and contract with your house, but old oil base paints are very hard and brittle. This situation can cause considerable damage and premature failure as the old paint is torn off the surface. Exterior metal surfaces can benefit from its use. Being a hard finish, any surface that receives harsh abuse can look good for longer periods. Examples would be metal gates, furniture and even metal buildings. This type of paint can also stop the formation of rust. Where the paint can be applied depends on many factors. Here in Colorado (USA), the UV light intensity is very high. This causes alkyd paints to oxidize much faster than their acrylic counterparts. So these products are less popular for exterior use. They could be a very good choice at sea level. Always consult with your local paint store about the best finishes for your area. Alkyd paint is thinned with mineral spirits and can have a strong smell. This odor comes from VOCs, volatile organic compounds, and can be difficult to deal with. Always ventilate a room you are working in and take all the proper precautions. If you have any know allergies to VOCs, consider the acrylic paints for your painting needs. This paint can be applied with a natural bristle brush, synthetic roller cover or sprayed. An excellent finish when applied with a HVLP paint sprayer. Generally very easy to apply and user friendly due to its ability to flow on the surface, providing a hard enamel like finish that is sure to please.